The amount of money being paid into many new company pension schemes is much too low, says a report from the advisory firm Mercer. Its survey of 400 employers, operating 600 "defined contribution" schemes, found contribution rates have risen only slightly in the past five years. In 2002 employers and staff paid in 9.5% of salaries, but now pay in 10.4%. Most of these schemes have opened since 2000 as employers have shut traditional final salary pension schemes. "Total contributions, while slightly up, still fall short of supporting decent pensions for the majority of people," said Tony Pugh of Mercer. "At the current rate, most employees will get more pension through state benefits than their occupational plan, which may come as a surprise to many." The survey highlights the reduced levels of company pension provision. It was previously thought that an average contribution rate of 15% of salary, throughout a 40-year career, was the minimum necessary to provide a decent individual pension fund at retirement. That figure is now much higher as people are living longer, and the cost of buying a year's worth of pension has risen sharply, compared with the cost of doing so in the 1980s and the early 1990s. According to Mercer, current contribution levels will enable staff to buy a pension equivalent to just 20-30% of their pay, after 30 years' service, compared with the 50% or more of pay that many employees expect. Many employers have closed their final salary schemes to new entrants to cut costs and offered them inferior defined contribution schemes instead. However, these new staff bear 100% of the investment risk, something once borne by their employer. That is because their eventual pensions will depend on how much their investments have accrued by the time they retire, and will also depend on how much annual income their eventual pot of money will then buy. To make things worse, in many schemes the level of contributions from both employers and staff is far lower than that seen when their final salary schemes were open. Earlier this year the Office for National Statistics (ONS) reported that in the private sector, final salary schemes that are still open had overall contribution rates of 19.2%. 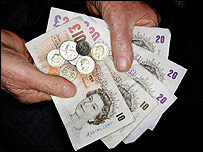 However, defined contribution schemes, in 2006, had contribution rates of just 8.9% of salaries. An analysis by the ONS also confirmed that employers have generally paid in far less to their defined contribution schemes than they did to their final salary schemes.